In reality, socialism has hurt Nordic countries like Denmark and Sweden. The US should avoid their mistakes, not repeat them. At first glance, it seems that the Nordic countries of Europe have become everything the Left admires: prosperous, yet equal and with good social outcomes. And the left loves to attribute it all to socialism. But a closer look shows that what the left admires about Nordic societies is not due to socialism, and that the true lesson from Nordic countries is the importance of free markets and a vibrant work ethic. Denmark has been a pioneer in showing the world how a nation can succeed, both in creating a strong economy and a good society that provides opportunity for all its citizens and supports those in need, a society bound together by shared values and respect for real differences. We can all learn from your efforts to educate your people for a lifetime, to give them the tools necessary to make the most of their own lives in a time of global, economic, and technological change. In his book Back to Work, published in 2011, he went further by claiming that Finland, Sweden and Norway offer more chances for individuals to out-earn their parents than the United States does. This admiration for Nordic politics is, it turns out, not a uniquely American feature. In fact, in many parts of the world, the left is using the Nordic countries as the number one argument for why socialism and large welfare states work. I have previously written about this issue through a couple of papers the short book Scandinavian Unexeptionalism, which came out last year. The work has — in part and full — been translated to Spanish, German, French, Polish, Farsi, Korean and currently also to Japanese. A few weeks ago I was able to publish the follow-up book Debunking Utopia — Exposing the Myth of Nordic Socialism, which deals more in-depth with the myths surrounding the idea of socialism working in the Nordics. Learning more about the Nordic experience makes it possible to counter much of the favorite arguments of the modern left, and perhaps even make those who believe in socialism aware of the limits of politics. So let’s look at some of the myths surrounding Nordic socialism. The success of Nordic countries is based on the fact that historically they have relied on free-markets and protection of private property. The only exception is a short period in Sweden (see myth #2) wherein socialist policies crippled growth and job creation. Nordic nations do have high taxes and generous welfare, but in many other regards they have unusually free markets. 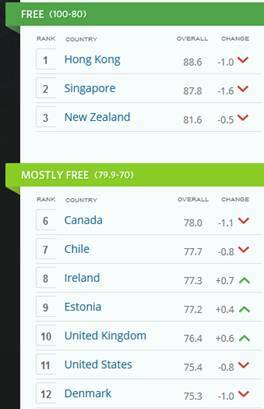 A quick glance at the latest country ranking in the Index of Economic Freedom confirms that Rasmussen is right, and that the American left are wrong in viewing Denmark as their prime example of socialism. Denmark has only a marginally lower economic freedom score than the US — in last year’s ranking, Denmark was marginally ahead of the US. That’s because Denmark, like the other Nordic countries, compensates for a large public sectors by having market-oriented policies in other fields. When it comes to areas such as business regulations, trade policy, investment freedom, vouchers in the provision of education, elderly care and health care, and partial privatization of retirement savings, Nordic countries are among the most free-market in the world. In fact, in these areas, the US has a lot to learn from Denmark and the other Nordic countries. This couldn’t be more wrong. Sweden is the only Nordic country that actually experimented with socialism, during the 1970s and 1980s. It is difficult to see how these policies could be viewed as anything else but a massive failure. Sweden’s economic development can be divided up in four eras. A free-market era lasted between 1870 (when capitalism was introduced) and 1936 (where the social democrats came to power). During this time the economic policies of the country were characterized by minimal government involvement, and the Swedish economy grew more rapidly than any other Western European country. Between 1936 and 1970 Social Democrats made their way into Swedish politics, but even leftist governments were careful not to disturb the free-market. Sweden’s growth rate fell to an average of Western European economies for this period. Then came an era between 1970 and 1991 when social democrats actually tried to introduce a form of planned economy in the country. Sweden’s growth rate fell to the second lowest among western European countries. The center-right government that was elected in 1991, and consequent governments on both the right and left, have moved the country towards free-markets again. As a result, Sweden has experienced the second highest growth rate in western Europe during its new free-market era, between 1991 and 2014. Once you gain more knowledge about the actual economic histories of Sweden and other Nordic countries, it turns out that their experience is not a case for socialism, but rather strongly points to the benefit of economic freedom. As I show in Debunking Utopia, this is not only true about Sweden, but also of the other Nordic nations. At first, this seems to make sense. 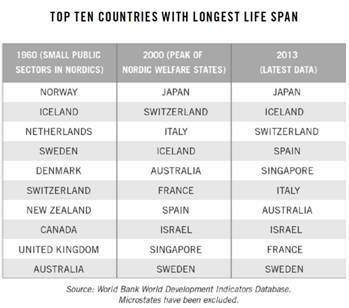 After all, Nordic countries have high life spans and low child mortality. Surely this is the effect of democratic socialism? Well, again a closer look debunks the leftist myth. In fact, we find that the admirable social outcomes pre-date the welfare state. Today, Nordic countries stand out as having high-tax models. Denmark, for example, has the highest tax rate among developed nations. But in 1960 the tax rate in the country was merely 25 per cent of GDP, lower than 27 per cent in the U.S. at the time. In Sweden the rate was 29 percent, only slightly higher than the US. What might come as a surprise to American admirers of Nordic countries is that the admirable social outcomes of Nordic countries were in place already at this time. The tables below show the global rankings of life span and child mortality — before the introduction of large welfare states in the Nordics — at the peak of generous welfare state policy compared to the latest data. The good outcomes existed well before the creation of the welfare state — which makes sense since they are linked to the healthy diets and lifestyles of Nordic people. If anything the Nordic countries have slipped behind somewhat after the introduction of large welfare states. So while in average person Denmark, the modern economy with the highest tax level, lives 1.5 years longer than the average American, let’s not forget that when Denmark was a small tax country this difference was 2.4 years. 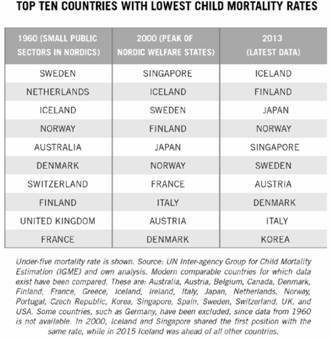 Also, those who believe that the good outcomes of Nordic countries are simply a result of large welfare states should be aware that Iceland — the Nordic country which historically has had the smallest welfare state — is the one with the highest life span and lowest child mortality. Denmark — the Nordic country with the largest public sector — lags behind its neighbors. While American-style capitalism leads to wealth for the one percent rich, the Nordic systems distribute wealth much more evenly. Surely at least this argument for Nordic-style social democracy is true? In part I think it is — redistributing money through high taxes does create income equality. Yet there is more to this story. 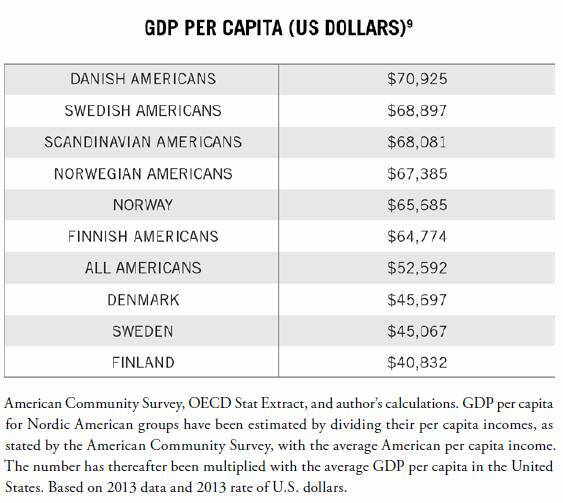 What many on the left don’t seem to be aware of is that the income equality of Nordic countries has more to do with the history, culture and demographics of these countries than with democratic socialism and government redistribution. Swedish economists Jesper Roine and Daniel Waldenström explain that “Most of the decrease [in income equality in Sweden] takes place before the expansion of the welfare state and by 1950 Swedish top income shares were already lower than in other countries.” A recent paper by economists Anthony Barnes Atkinson and Jakob Egholt Søgaard reach the similar conclusion for Denmark and Norway. What leads to income equality in Nordic countries? The answer seems to be a Lutheran culture with strong emphasis on work and individual responsibility, combined with homogenous populations and the wealth-creation of capitalism. The countries, which already had prosperity, equality and strong norms about individual responsibility, then chose to move towards generous welfare. With time however, Nordic people adapted their work ethic to large welfare states. It has become more acceptable to rely on government support, even if one is healthy enough to seek employment. Massive welfare dependency has grown, not least among those with an immigrant origin — I myself grew up in a family supported by welfare. So although Nordic welfare states certainly do help the less fortunate through government benefits and services, this does not only combat poverty but also unintentionally creates social poverty. The thing to hold in mind is that the success of Nordic societies obviously has much to do with their unusually strong ethical norms, and not just their welfare policies. So what happens if the same culture is combined with another political system? We can find the answer by looking at Nordic-Americans. Historically, it was mainly the impoverished people in the Nordic countries who sailed across the Atlantic to found new lives. Despite this, Nordic-Americans have managed to be much more affluent than their cousins who stayed behind. Today Danish Americans have a fully 55 percent higher living standard than Danes. Swedish Americans have a 53 percent higher standard than Swedes. The gap is even greater, 59 percent, between Finnish Americans and Finns. Even though Norwegian Americans lack the oil wealth of Norway, they have a 3 percent higher living standard than their cousins overseas. Bernie Sanders, Hillary Clinton and Barack Obama would be shocked to find out that Nordic Americans are also more socially successful than their cousins in the Nordics. They have exponentially lower high-school dropout rates, much lower unemployment rates and even lower poverty rates. Similarly, immigrants to the Nordic countries fare worse than those to the U.S. in regards to employment, self-reported health and the school result of their children. Once we compare apples-to-apples, the case for adopting a Nordic-style welfare model in the U.S. and other parts of the world suddenly becomes less strong. 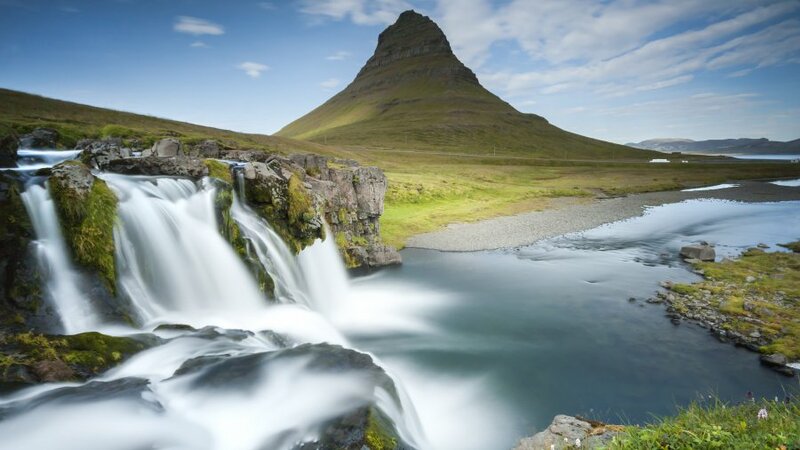 In fact, the Nordic countries themselves are gradually moving away from the very generous welfare model, adopting systems that are more focused on individual freedom, market forces and self-reliance. The true story of Nordic success is in this regard important for the advocates of freedom to learn, not because Nordic countries are important in themselves, but because of their status as the ideological Shangri-La of the left. Dr. Nima Sanandaji is an author and researcher of Kurdish-Iranian origin who migrated to Sweden as a child and grew up in a welfare supported family. He holds a PhD degree from the Royal Institute of Technology in Sweden, and has also conducted research at the University of Cambridge. He is the author of the new book Debunking Utopia. Socialism is a setup for tyranny. It only works if you want this. Everything working only if you want this. We never had any governing model which wasn’t ideology. Opossite of ideology is fascism. Socialist ideology is the same ideology as free market. It works only as a set of ideas you believe in. @pank, you utterly misunderstand what John said: Socialism leads to tyranny, and who in their right mind wants tyranny?!? You, maybe? I don’t. Thank you, Dr. Sanandaji. Unfortunately, no matter the facts, the left will disparage them. Why? Because they have an agenda which is to create a planned society because they’re so certain they can make the utopia happen. Making the utopia happen is their sole focus. It’s the god of their fathers who instructed them well. They will never abandon utopia. So, like Lenin they will do what they have to do even if it means the death of a few million people to establish utopia as the one, true god. What will they do about Allah? There is no left anymore, you would have to have a proletariat and unions working for it. While somwhere tripartity still making the greatest out of capitalism, majority of weste is neoliberal and the class you are talking about is so called precariat. The old Marx/Weber structure of class died with the beginning of neoliberal policies, so after those families, who are owning our world is coming elite, then salariat and precariat, without any rights, welfare, benefits, nothing to work in whatever set ups, under whatever conditions. Nordic model is capitalism with state overlooking the welfare, paid by higher taxis, which are transparent and the dame for ALL. 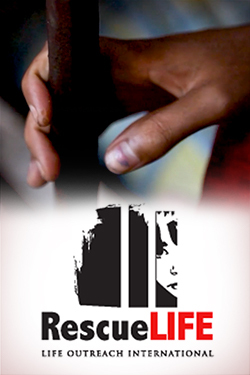 No offshore funds and minimal to none corruption. Everything is the same, but redistribution of wealth is genuine, less billionaires and thus criminal activities, investments which benefits all, while you can be very rich ifyou are good under fair/play conditions. I gather you disagree with this piece, but your interesting English leaves me wondering about your actual point(s) of disagreement. Look for your own info and compare. #6) socialists, leftists, progressives, neo-libs, neo-cons, neo-commies.. Call them what you will, they all hate Nordics. I don’t believe anybody canbe this bias as you. Upfront, the author recognizes that the Nordic states, by every quality of life measure, outpace the US. His attempt at correlation as to why could make the case that its because these northern countries experience more dark in the winter and more light in the summer, but instead caulks it up to Nordic genes – ironic because of his own personal history of being a Muslim child immigrant who now has a PhD and a succesful academic and think tank career, all courtesy of the system he now degrades so that he can hawk his silly book to the gullible. I saw no mention of their genes in this article. However, Nordic Americans do better than Nordics in their own countries. Wow your lack of reading comprehension is breath taking. Plus those European countries rely on the umbrella of NATO and do not have to be the world’s policeman. Thus very little spent for defense.